There are few things that I love quite as much as a good latte. Most of them are things I’ve promised not to blog about here. DC is definitely in the top five cities in the US in which to get a great cup of coffee, or better yet, a specialty coffee drink like a latte or a mocha. I can think of five different great places all within a stones throw of the Metro in DC, but now we’ve got to add one more: Pound Coffee over in NoMa. Next week they’re offering all espresso drinks for half-price, featuring five different espresso-based drinks Monday through Friday, including what sounds like an excellently tasty Nutella Latte on Monday. They’re just a block from the New York Ave Metro stop, just across from the ATF building. Go check ‘em out. DC’s got such a great coffee scene, you can afford to have many shops. See you there. Disclaimer: Karl Johnson is a writer at We Love DC and part-owner of Pound Coffee. This post received no special consideration because of Karl’s status and was submitted through the traditional channels. It’s even closer than that: Pound is across the street from the north entrance to the Metro, right there on 2nd St. Great find, by the way! If Pound wants any business other than the few workers who go to the newly-built office buildings, they’re going to have to open on weekends. Would love to try it out but nearly impossible to do. Who can get anywhere by 5 pm?? Karl Johnson, if you’re reading this and a part owner, could you please hire some staff for the weekend? 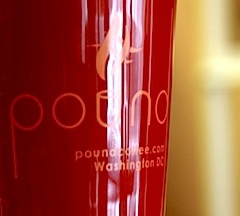 How about doing a quick rundown of DC’s great coffee shops for folks who just moved here? Pretty please?! I’ve had a good many Pound Lattes. They are good, the people nice, and the window bar is a good spot to do some work in the morning and get in get in some people watching whenever you want to look up. I’ve not taken the metro all the way in first thing, but stopped and got a coffee at Pound, got the day in order there, then got back on the red line on a less crowded train. Feels like an extra weekend morning. Try it. (Disclaimer: I have kids, which is great, but weekend morning personal time not what it was pre-kids). The vast majority of our business comes from people work in the office building nearby so those are the people who can get there by 5pm. We’ve tried being open on weekends and nights before, but there had been very little foot traffic outside of office hours. However the area is quickly growing and changing and we plan to start opening until 7pm on weeknights and all day Saturday as of April 1. G and Anne – thank you so much for your compliments! Come and see us again! Just to confirm my last comment, we are officially going to be open from 6:30am to 7:00pm Monday through Friday and from 8:00am to 4:00pm on Saturdays starting April 1!